The Hat Fire soon after it started. 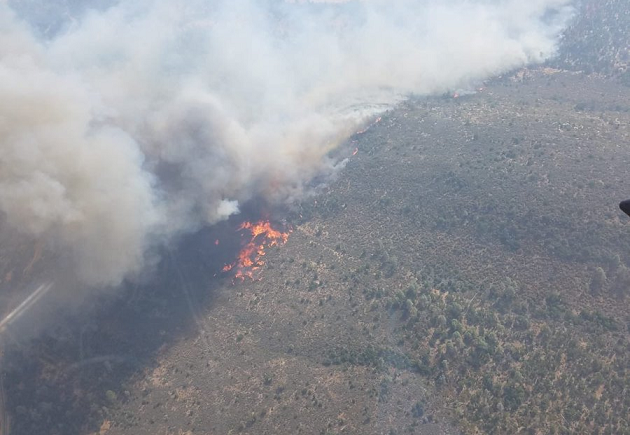 UPDATE: FRIDAY, AUG. 10 , 9:45 -- Just as the destructive Carr Fire approached the halfway mark in containment, two new fires broke out in Shasta County. 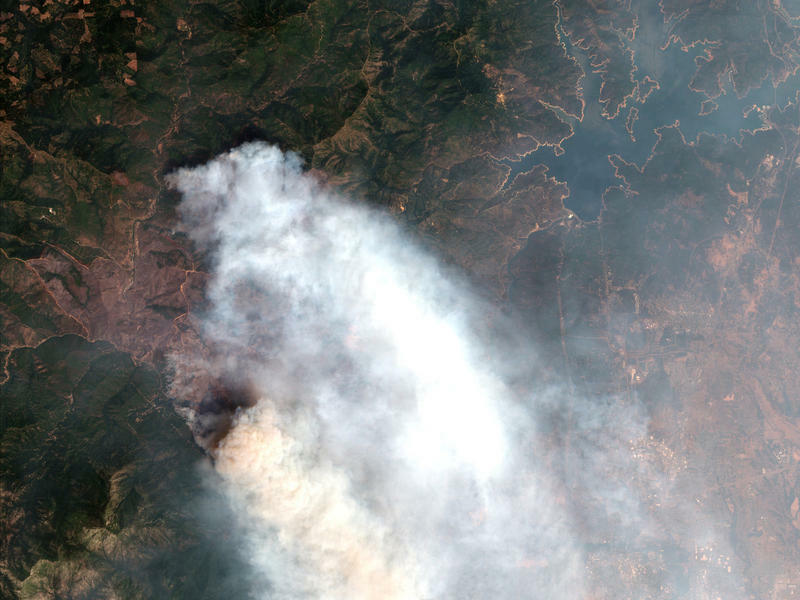 The larger of the two, the Hat Fire, is burning in brushy land near Fall River Mills, in eastern Shasta County. First reports of the fire came in sometime after 3 PM. 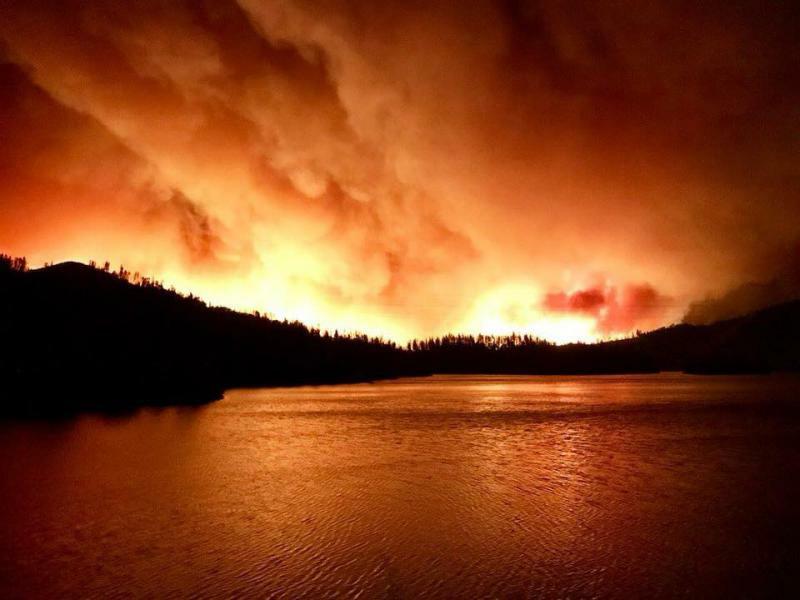 As of 7:22 on Friday morning, it had burned 2,500 acres and was 15 percent contained. A red flag warning for extreme fire weather was in effect at the time, and National Weather Service maps show wind gusts in nearby Burney up to 24 miles per hour. State highway 299 remains closed after the fire burned across it. The Shasta County Sheriff called for evacuations along Glenburn Road. An evacuation shelter was set up at Fall River Mills High School, but a power outage forced the shelter to move to the community center in Adin, more than 30 miles further east. 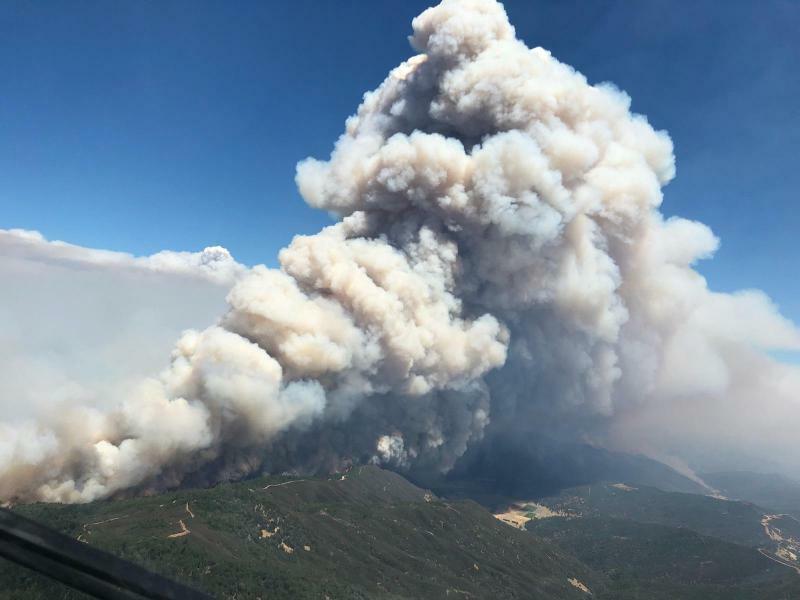 At Shasta Lake, three fires collectively called the Hirz Fire covered 450 acres by Friday morning, burning in oak woodland near Hirz Bay on the McCloud River arm of the lake. The Shasta-Trinity National Forest reported that the two larger fires had merged and the single fire was burning toward Hirz Mountain. The fire is 10 percent contained as of 9 a.m. Friday. As one Twitter contributor said of the new activity, "This is terrible. It might be easier to show what parts of California AREN'T on fire at this point." Daniel Swain and Ryan Sandler talk about fire, weather, and climate. The view from Redding on that Thursday night was terrifying. A thick curtain of smoke got between the city and the setting sun, and flames seemed to leap from ground to sky. Scientists have confirmed that there really was a "firenado" as the Carr Fire brought its destruction into town. Daniel Swain at the Center for Climate Science at UCLA has been looking at the data. Ryan Sandler at the National Weather Service in Medford knows how things usually work in the atmosphere. UPDATE: FRIDAY, AUG.10, 10:30 a.m. --- California's largest-ever wildfire is is slowing down, as fire crews have wrestled one part to a standstill and are steadily gaining on the other.